1160 Farmhouse Lane consists of two parcels totaling 4.65 acres adjacent to the San Luis Obispo City limits (APN 076-511-039 and 076-511-040). These parcels have an approved County development plan for up to 80,000 square feet of building. A detention basin has been constructed on the rear of Parcel 3 to benefit both parcels. --- One adjacent parcel also for sale ($2,700,000.00). 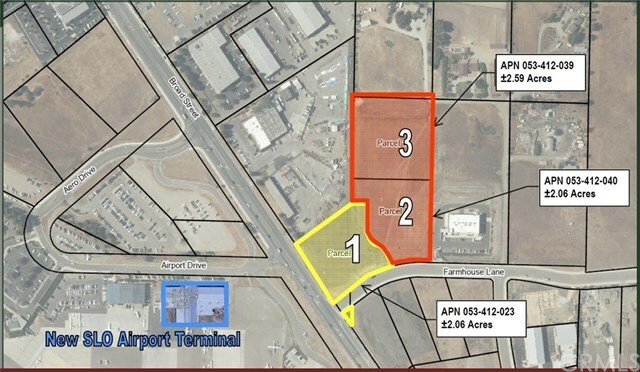 4640 Broad Street is a 2.06 acre parcel within the San Luis Obispo City limits (APN 053-412-023). It is located directly across Hwy 227 from the new airport terminal.